Share "Should Your Dog Sleep on the Bed With You?" Dogs can be great friends and loyal companions, but they don't always make the best sleeping partners. 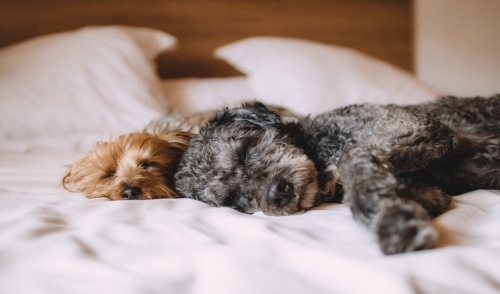 It is very common for dog owners to allow their pet in their bed – either sleeping at the foot of the bed or even underneath the covers with its head on the pillow – but is this type of sleeping arrangement best for you and your dog? If you are allergic to dogs or pet dander, sleeping with your dog can aggravate your sensitivity and cause severe reactions. Not only will the dog be close to you, but the fur, dander and sweat that sparks your allergies will be spread on your pillow, sheets and even into the mattress. Your body will not have any time to recover from allergen exposure, and you may need stronger doses of allergy medication to compensate. Furthermore, consider your dog's allergies – some dogs can be sensitive to the fabrics and fillings used in bedding, and sleeping in your bed can make them uncomfortable as well. Dog owners with asthma can experience stronger breathing complications if their dog sleeps in the bed with them. The stronger concentration of pet dander and shed fur can aggravate asthma symptoms, and breathing can be especially labored and difficult, making sleep impossible. It is best if you have a break from that type of exposure overnight to allow inflammations to subside and make breathing easier. Just like humans, dogs can be active sleepers. They may toss and turn, snore, scratch, kick, pass gas, growl and even bark in their sleep. If you are a light sleeper, your dog's normal sleeping habits may interfere with your rest if they are in the bed with you, making it difficult to get enough sleep to be rejuvenated for your day's activities. When a dog is accustomed to being in the bed for sleep, they may want to always be on or near the bed when you are in the bedroom. This can make intimacy with your partner more awkward, particularly if your partner does not share your fondness for the dog. If the dog is getting between you and your partner, your human relationship could suffer from a lack of physical closeness. Young dogs have not always learned to control their bladder adequately, and senior dogs may lose some control as they age. The result is the same – minor leakage as the animal sleeps. If the dog is in your bed, this could mean dirty, smelly sheets that need more frequent cleanings to stay fresh and odor-free. Sleeping in your bad isn't always the safest position for a dog. A small dog might be smothered by heavy blankets or could be crushed if you were to accidentally roll over on them in your sleep. Elderly dogs may also have trouble jumping onto or off of the bed, and a fall or slip could cause severe injuries. If your dog has an aggressive nature or territorial control problems, allowing them to sleep in your bed could create a struggle for dominance, especially if you try to change the sleeping arrangements. Extensive training and positive reinforcement will be necessary to manage your dog's behavior in the bedroom. Despite some of the negative aspects of sleeping with your dog, having a dog in the bed with you can be very relaxing and warm. Your dog's presence may be soothing and give you a feeling of security and relaxation, allowing for better sleep and more restful nights. This can be an important bonding time between you and your pet, especially if you are away from home for long periods during the day. Ultimately, the decision of whether or not to let your dog sleep in the bed is up to you. Even if you do allow them to join you in or on the bed, however, it is good to have another sleeping option for your pet and train them to use it on command. This may be a crate, cage or dog bed nearby, which can be useful for times when they aren't quite so welcome on the bed with you, as well as when you may be traveling or when injury or illness changes your sleeping circumstances. Nighty night!